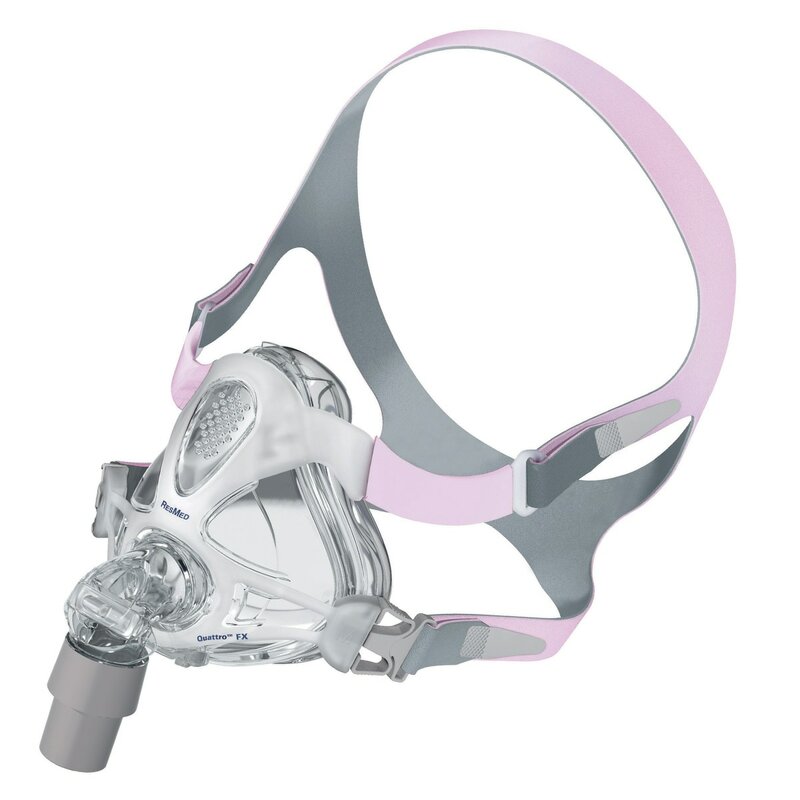 Quattro FX & Quattro FX For Her are sleek, compact alternatives to traditional full face masks. 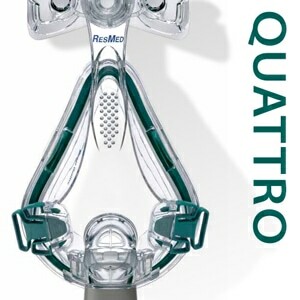 Because Quattro FX masks seal lower on your nasal bridge, you get a clear line of vision and a feeling of openness not found in more conventional full face masks; and Quattro FX masks also include an innovative spring frame that provides balance, stability and flexibility, giving you a wide range of movement without compromising your sleep. Personalized Styling for Men & Women: The Quattro FX is available with different cushion sizes and headgear colors to fit a wide range of men's and women's preferences. 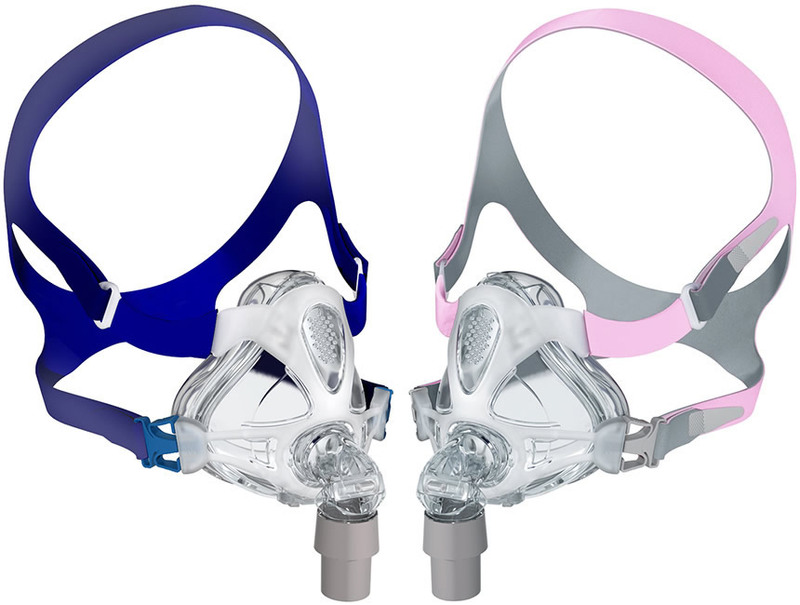 The Quattro FX includes dark blue headgear and frame highlights while the Quattro FX For Her comes with pink and gray headgear with pink frame highlights. 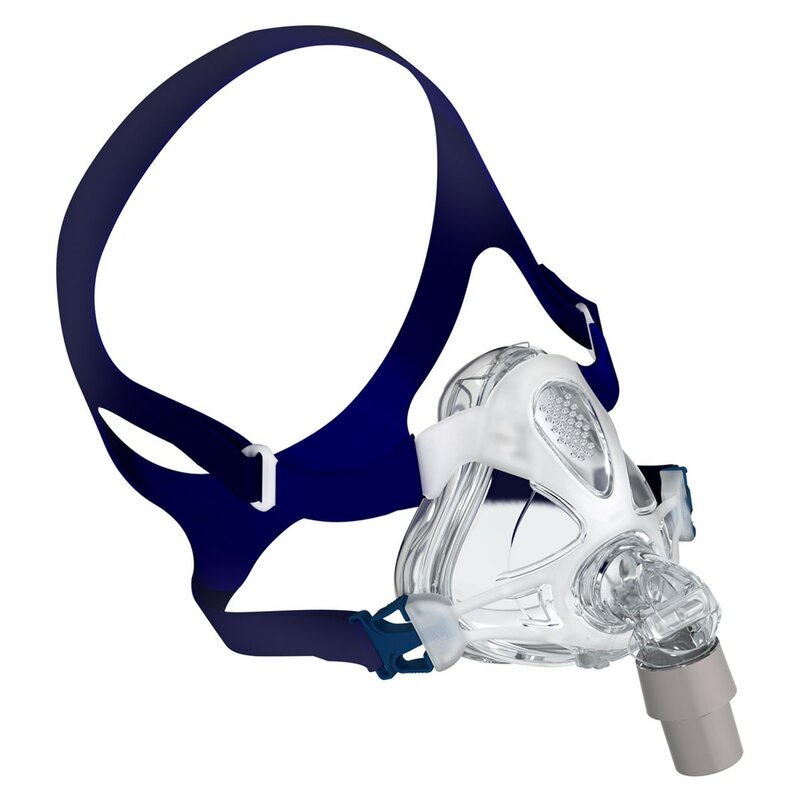 Flexible, Durable Spring Frame Provides an Open Field of View: The Quattro FX's Spring frame offers the same stability and angular adjustment as conventional full face masks but WITHOUT the annoying pressure and obstruction of a forehead support. Soft Dual-wall, Spring Air Cushion: The Quattro FX's Spring Air cushion provides soft, even pressure distribution around the nose and mouth, absorbing even the slightest user movements. 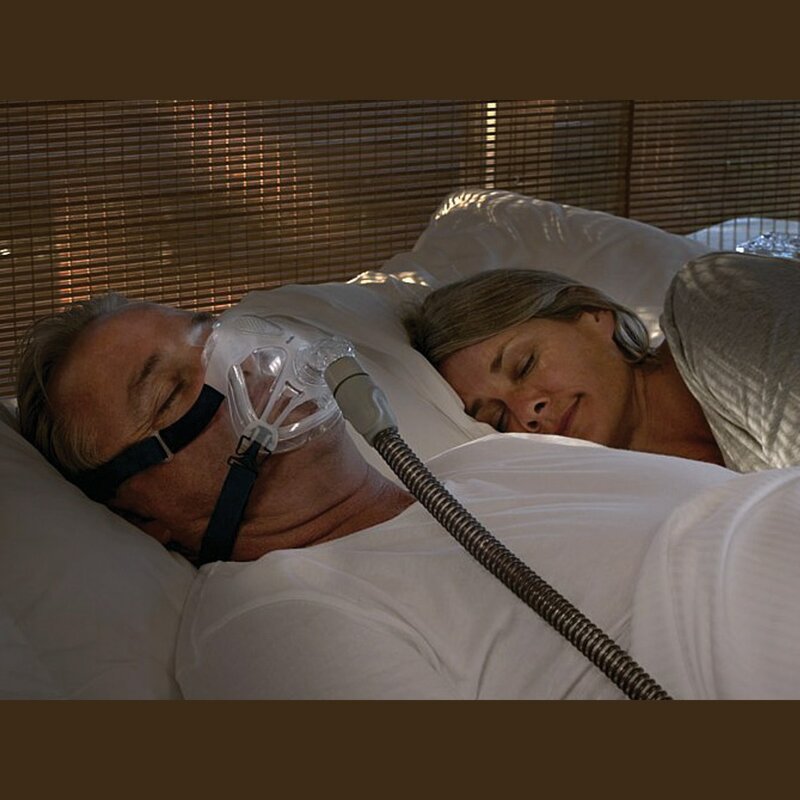 The cushion's supportive, inner layer provides stability while the soft, outer membrane gently inflates to create a safe and secure seal against the skin of the face with particular softness at the sensitive nasal bridge. Simple, Set-and-Forget Headgear: Quattro FX & Quattro FX For Her feature Set-and-Forget Headgear that reduces tension and eliminates pressure points. The headgear's contoured crown strap sits snug at the top of the head, avoiding sensitive areas around the back of the neck, while easy release clips make it easy to remove while preserving a personalized fit. Built-in Vents Disperse Air Softly & Quietly: The ingenious elbow of the Quattro FX & Quattro FX For Her includes a 360° swivel that reduces tubing drag and improves freedom of movement. 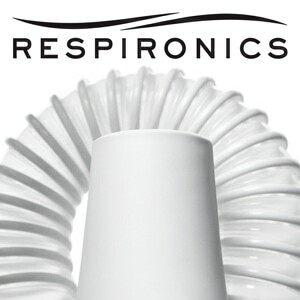 Vents within the elbow quietly disperse exhaled air away from the wearer without disturbing bed partners. One of three masks I have tried in the last month and is one of my favorites. Small and lightweight while fitting well with no leaks. The straps rest on my cheekbones but very comfortable. Very comfortable to wear BUT my AHI was a little above what was is considered normal when using it (AHI over 4). With that being said, I disagree with the maximum pressure rating. My air pressure is near the maximum recommended psi. I wish it could get my numbers to be normal so I could use this mask on a daily basis. Love not having the forehead brace, but the wings that hold the nose tight are too close to my eyes. Those support need to be lower or more straight across. 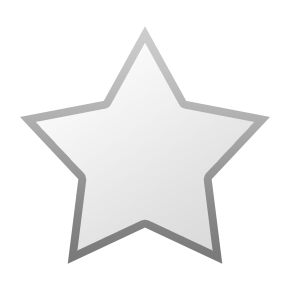 Most nights it is painful because the mask is pushing on the underside of my eyes. I have yet to experience air loss, as described by many reviews. However it still needs some modifications to be a great mask. The small choice fits, but as far as the ad saying; Set I and forget it just isn't true. Some nights this is the most comfortable mask I have ever used, I don't even feel it on my head or face. Other nights it leaks into my eyes so much I can't sleep. 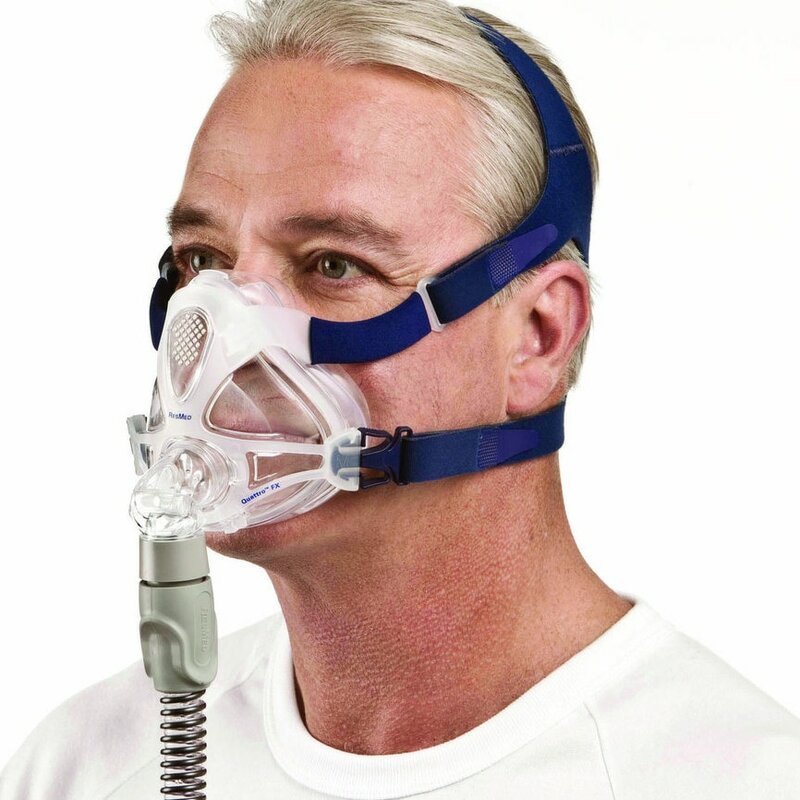 It's like constantly being tickled by a feather in the night - a funny joke, but not a way to live with sleep apnea! I don't know what changes. I am still trying new products to see if there is one that leaks less, but this is my fall back between shipments! I thought this mask would work, but no matter how I adjusted it, it blew air in my eyes and pinched my face. The headgear was also ill fitting and uncomfortable, and after a couple of nights of torture, I sent the mask back. Thank goodness for mask insurance! 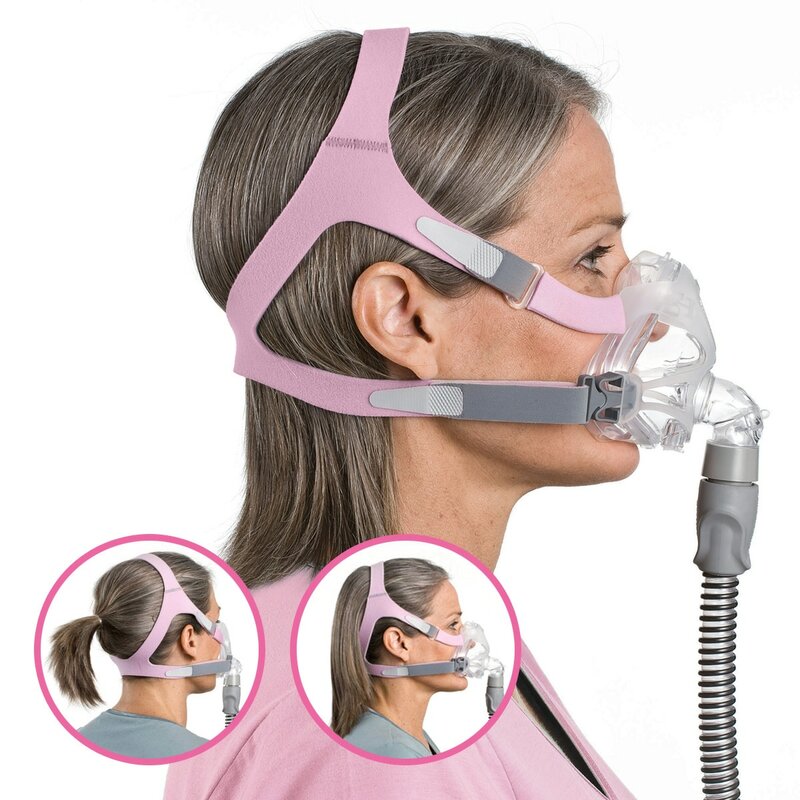 I think masks with adjustable forehead braces probably work better for narrow nasal bridges. At a pressure of 14 I just couldn't get this mask to fit and not leak. I tried medium and large mask sizes, and medium and small straps. The mask did not fit the contours of my rather average face - average weight, height, etc. The soft part was not able to compensate for the way the hard part didn't fit. If it fit I'm sure it would have been fine - your luck may vary.